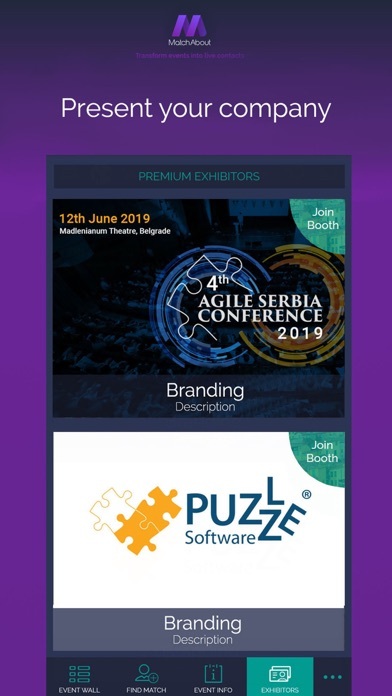 Never-ending story, because once you’ve joined the app, you will be able to collect contacts, materials and any other kind of valuables from event to event. Also to keep all of them safe at one single place. Whether you prefer to be in focus of event or you just prefer to be on track, this is the right place for you. Because we are always on the source of happening and our mission is to transform events into real life opportunities! 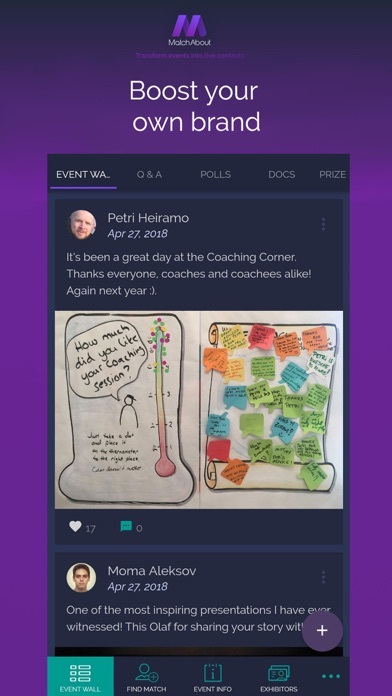 Take some of the most important advantages of MatchAbout (features): •	Polls, prize games, Q&As, event wall to keep people fully engaged during event, •	Easy access to materials – event wall, •	Easy tool for targeting – search for people on events by their role, position, same interests... •	Easy way to log in – by registration, your LinkedIn or Facebook account, •	Real time event agenda, •	Insight information – all information regarding event or participants, •	Notes for the incoming insight – comments, impressions, conclusions... What kind of values you will get using MatchAbout (benefits): •	Activation of all stakeholders involved in an event by matching and engagement... •	Ability to connect, find & share mutual interests, be informed, exchange messages, schedules... •	Great marketing opportunities for event organizers, effective personal and business promotion. Your profile: •	Customize your profile with a photo, your title and company, description... •	Share your interest with other people and what are you looking for at the event, •	Find people with the same interest and similar stories and share experiences, •	Chat privately with your connections, •	Go live with your pictures or messages on event wall. 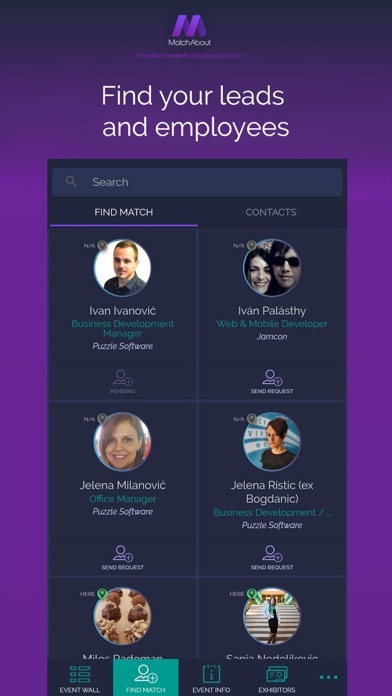 How to use MatchAbout: Simple as that! 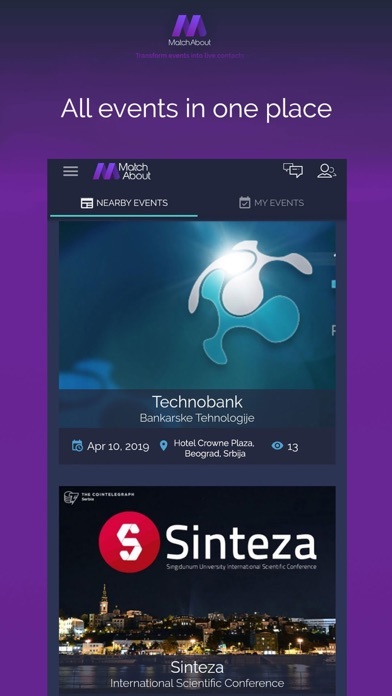 You may log in MatchAbout app by registration, or you can join directly by your LinkedIn or Facebook account. After log in you are on the Event List page and you can see all nearby events. Choose which one of them you prefer to join. 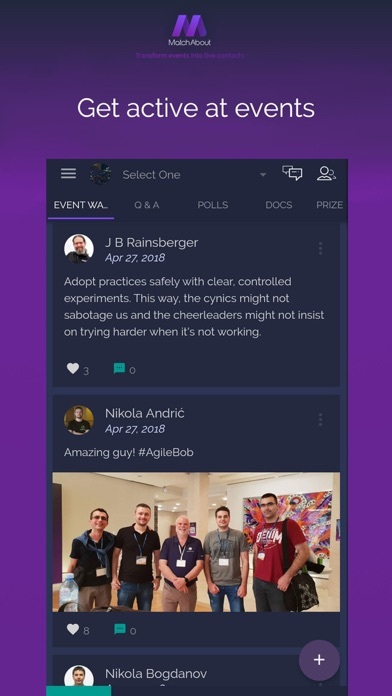 When you are log into event you will see Event Info page with all information about event and you will have opportunity to apply with multiply options (post something at the event wall, connect with other people, polls, Q&A..). 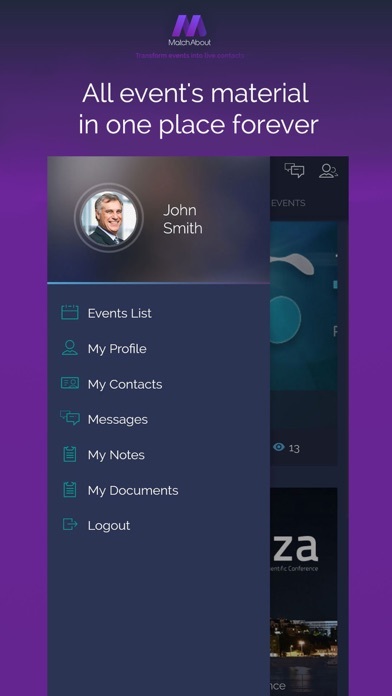 On the left side of app drop-down list you can do settings of your profile, view your contacts, messages, notes or to log out. 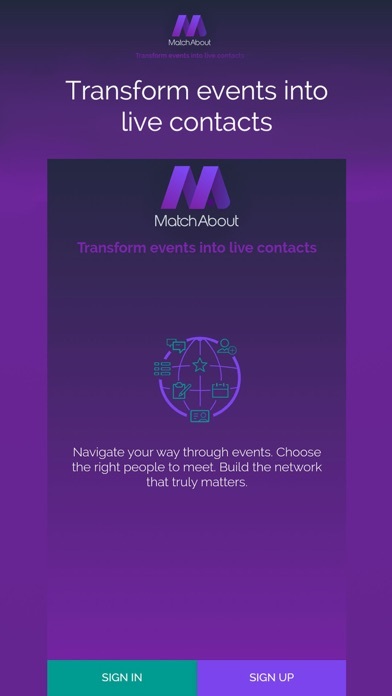 Welcome to MatchAbout, enjoy your experience!